Hey All !! How are you doing? As I mentioned in my last post, I am starting the So-Shaadi Series today with a lot of enthusiasm. When I started the So-Shaadi series, I thought this would be a one time affair and never thought it would be a segment on So-Saree. But seeing the popularity of the series and requests from So-Saree Readers I have decided / you can say I will atleast try to do this segment once a year. So, when I announced the end of the So-Shaadi Series on my blog last December, I received a sweet message from a blogger friend. She was disappointed I was putting an end to this segment, as she was going to be a bride in a few months and wanted to feature on it. And like we always say on So-Saree...Never say Never..! So, I decided that whenever I re-start this segment it will be none other than Anupriya, who will kickstart this series. 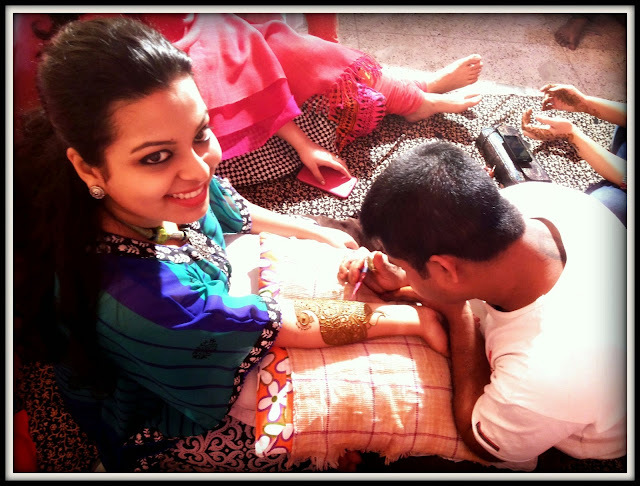 Anupriya, is one of my nicest blogger friends who blogs on Chappals vs Stilletoes. She also heads the very fashionable and quirky brand Howrah Bridge and I am guilty of not checking out on her latest collection, coz I fear I will blow up all my money buying her stuff. It's soo good. So Anupriya married the love of her life this February and she made a picture perfect Bong Bride. I loved what she wore, but more so I loved how beautifully she has penned down all the Bengali wedding rituals for So-Saree readers. Thanks Anu, I can't thank you enough. 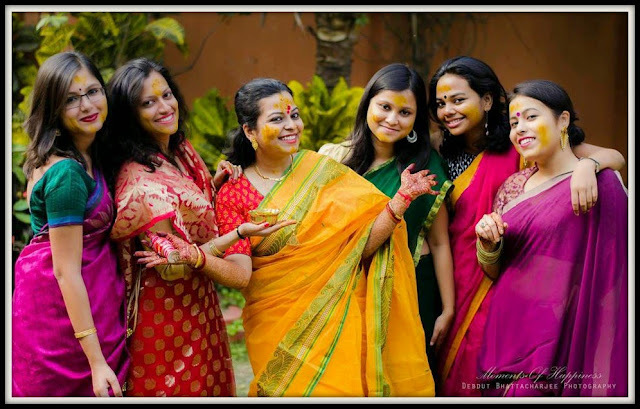 A Bengali wedding is as big & fat an affair as a Marwari or a Punjabi one. Preparations start from months ahead and the last out-of-town relatives leave the bride/groom’s house at least a week after all the ceremonies are over. Though my wedding date was fixed six months before, to my surprise, booking a venue took us almost a week as all major venues supposedly get booked one to two years in advance! So, after six months of running around, planning, manipulating, strategizing, going crazy and driving people crazy; the time finally came – outstation friends & relatives started pouring in, the trousseau started to get ready, last minute preparations were done and before I could say “marriage”, it was time for me to play Bride! The day before the wedding starts with frenzied preparations as that’s the day the bride has her last (big) lunch at her maternal home as a spinster. 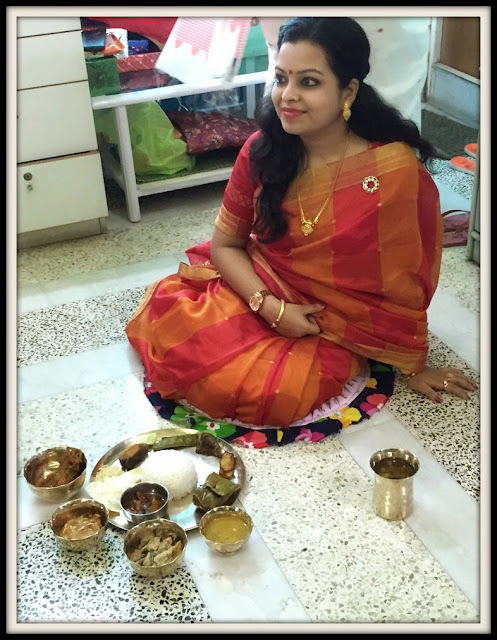 The ritual is called “Aaiburobhaat” [aaiburo = spinster, bhaat = rice] which demands the bride be fed a traditional lunch of rice, shukto (a concoction of various vegetables), daal (pulses), five types of fries, two to three kinds of fish, chutney (a tangy preservative dish), sweets &mishit doi (sweet yoghurt). This huge meal is spread out in front of the bride, who sits surrounded by her unmarried friends, sisters or cousins, who all are fed bits of the meal by the bride, thus increasing their chances of getting married soon (or so they say)! I wore a red/yellow/gold cotton silk sari for the occasion with gold jewellery that had already come in as wedding gifts from various relatives. Once the bride finishes her lunch and rests a bit – or rather has a photo session with her wedding photographer – it’s time for the Mehendiwala to come with his bag full of henna cones and fat albums full of beautiful designs to choose from. An evening of merriment ensues with the bride & her entourage of female friends & family having their hands henna-ed with intricate designs with filmi wedding songs playing in the background. I loved the peacocks swirling halfway up my arms and the traditional motifs on my feet even though it meant having to sit still with my hands & legs propped up till the middle of the night! Since the long & tedious process of applying henna required me to wear something comfortable, I opted for a georgette Howrah Bridge kaftan tunic & leggings for the evening which turned out to be a stylish as well as practical choice! The morning of the big day starts very early for the bride as she has to be up before sunrise to eat a concoction of yoghurt & puffed rice, because the bride has to fast for the rest of the day till the wedding rituals get over. We went over to the wedding venue by 8am and started preparing for the Haldi ceremony and Viddhi puja. I draped a customary taant (Bengali handloom) sari for the occasion along with gold ornaments (Bengalis can’t think beyond gold when it comes to wedding jewellery and this was possibly the only time I wore so much gold for so many days at a stretch). The sari that I had to wear for the Haldi, along with the one I changed into after the ceremony, came in the twatto (gifts that are part of the trousseau) from the groom’s house – along with other saris, cosmetics, toiletries, accessories they gave me for the wedding as well as gifts they sent for my family. I gave a twist to the traditional sari by pairing it with a printed blouse. The Haldi ceremony was a fun affair with married women encircling me, carrying out some customary rituals and then putting the first touches of turmeric on me. They were soon joined by the unmarried girls who also got a few streaks swiped on their faces, again for ensuring their quick marriage! I told them to keep the haldi-applying to a bare minimum as I had to take a bath and rush for my appointment with the make-up artist soon thereafter. Then came the final evening that will always remain one of the most memorable times of my life. I reached the venue, all dressed up in my bridal finery, to find a few guests already waiting for me. As the evening wore on, more & more guests started pouring in, inundating me with gifts, well-wishes, greetings & lots of love. My bridal attire was an Upadda silk sari (draped in a traditional Bengali style) in shades of peach/pink/orange with elaborate gold zari woven beautifully all over the body. I chose to pair it with a contrast green brocade blouse, a customized veil & of course, all my beautiful gold jewellery! The mahurat of the wedding rituals was late in the night and by the time the actual ceremony started, only the closest family & friends stayed back to witness the bonding of our souls. 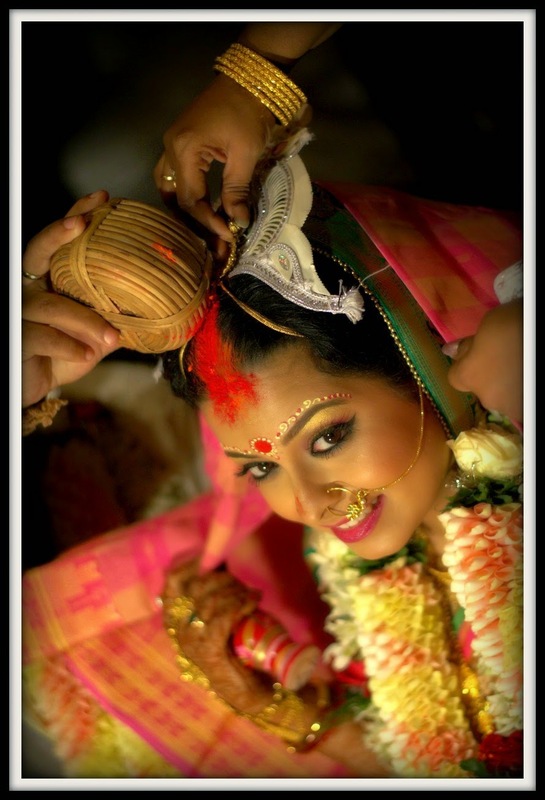 A Bengali wedding starts with the bride being carried to the mandap on a piri (a rectangular piece of wood meant for sitting on) by her brothers. In my case, all the men carrying me were friends whom I call brothers (and even tie rakhis on). 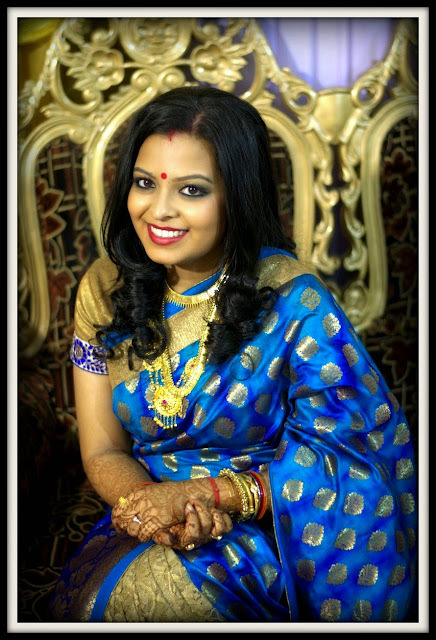 As per rituals, the guys carried me, circling the groom five times – with me holding betel leaves in front of my face, so that the bride & groom can’t see each other – at the end of which, I uncovered my face for the first sight of my husband-to-be! Amidst much catcalls & excitement, we then exchanged garlands three times for the mala-bodol ceremony. Then I’m set down back on the ground, with him sitting by my side in front of the holy fire after which the wedding puja starts. My father was called to join in the puja and do kanyadaan (officially hand over his daughter to the groom). This is followed by sindoor-daan when he put vermilion on my forehead, thus making me his wife. 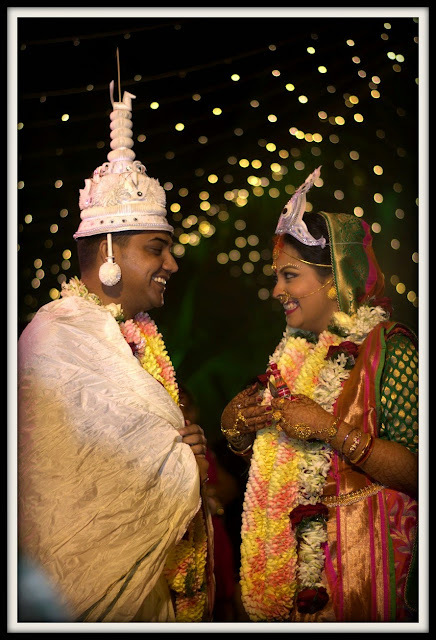 Then the bride & the groom has to take the saat pheras (go around the holy fire seven times, chanting the vows of marriage) and culminate the wedding by pouring khoi into the fire to douse out the flames. I left my home the next morning, after the vidaai rituals were carried out, and journeyed to my new abode to start a new phase of my life. I was received at his home by my mother-in-law who again carried out some customary traditions, while my father-in-law welcomed me to the household with yet more gold jewellery. Anupriya nice post. You look gorgeous. nice post and you look so gorgeous !!! Anupriya, you look soo pretty! Those sarees are absolutely fantastic. Yay I love love love all her shaadi pics. Ain't she the most prettiest Bengali bride. I wish I could get married again in Bengali style wedding too . Anupriya did make the most beautiful bride! Loved reading the story behind the gorgeous pictures! Lovely pics and love write-up. Anupriya looks absolutely gorgeous in every pic. Congratulations, Anupriya! Beautiful Bengali tradition, and beautiful bride, every parts of India comes with its own traditions and rituals. Every state comes with an wedding which is different and unique.